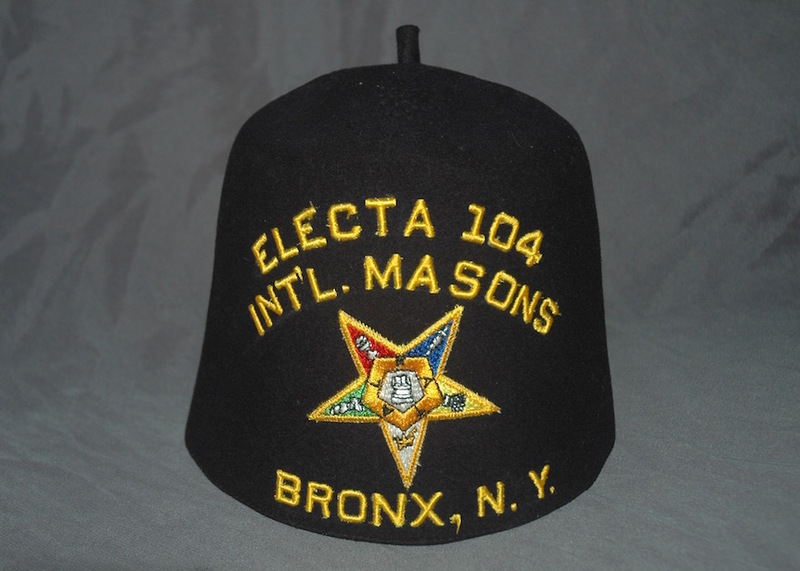 The International Free and Accepted Modern Masons, Inc. is an organization that is considered “clandestine” (in Masonic parlance) by all of the Prince Hall and State Masonic Grand Lodges of the United States and the rest of the world. “Clandestine” is a term used to indicate a mason or masonic organization that for whatever reason falls outside of the common statutes, landmarks, and traditions of those who consider them to be such. It is an obtuse definition, I know. Think of it this way: in the early centuries of Protestant churches, the Catholic church would have considered any such non-Catholics to be, in these terms, clandestine. Any such outré Christians would not have been welcome to sit in a Catholic church, and certainly would not have been welcome to receive sacraments there. Likewise, it would have been a violation of the rules and tenets of a Catholic to attend services in any such Protestant church, etc. Similarly, International Masons (and many other organizations that call themselves Masons), not being in amity with the predominant Grand Lodges, are not allowed in Lodges subordinate to those predominant Grand Lodges; nor vice versa. It does become a sticky subject, however. For about two centuries, the (predominantly black) Prince Hall Affiliated Masons were considered clandestine by the (predominantly white) so-called “mainstream” [sic] Grand Lodges, but generally only in America. Grand Lodges in Europe tended to accept and recognize Prince Hall, based on their clearly legitimate Masonic lineage. Over the past 30 years or so, many states in the US have come to recognize Prince Hall Masons, though some Grand Lodges (those being most of the formerly Confederate states and West Virginia) still consider Prince Hall Masons to be clandestine. Regardless, the pieces found under this subsection will belong to organizations that my Grand Lodge, the Most Worshipful Grand Lodge of New Mexico, as well as the Most Worshipful Prince Hall Grand Lodge of New Mexico, hold to be clandestine. It’s not a value judgement on my part, but rather a reflection of traditions and rules. 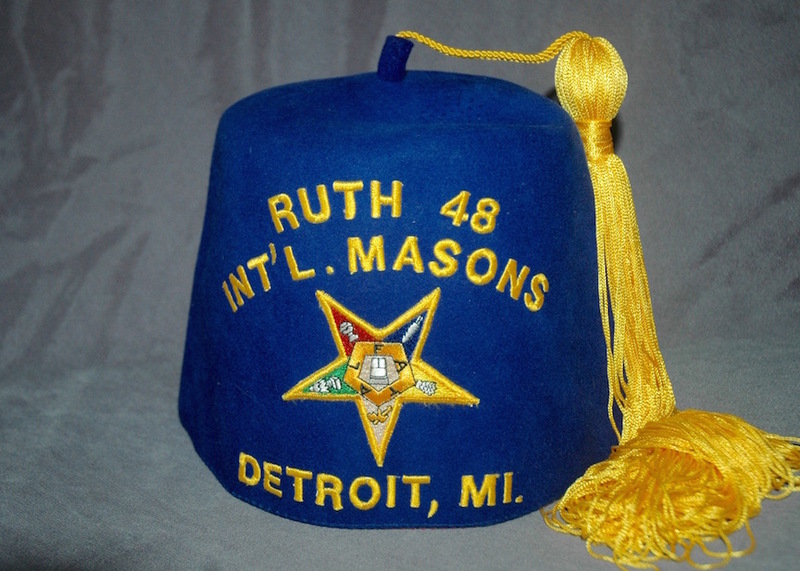 Blue OES fez from Ruth Chapter No. 48, Detroit, Michigan. Decoration is embroidered directly into the wool. Twelve inch yellow tassel, stitched to the fez just below the knot. Standard OES star (copy and paste)with an altar in the white center, with each ray with a different color and symbol. Red-cup. Blue-sword. Yellow-sheaf of wheat. White-crowned scepter. Green-broken column. At the inner points are the letters F A T A L.
Fez crown is perforated, and there is a synthetic leather sweat band. Interior panel over the reverse of embroidery is a satin-sheened polyester paper, layed in with adhesive, and has maker’s information: “D. Turin & Co., Inc. Hialeah, Florida. Masonic Supply Co. Fraternal Supplies and Jewelry, 175 5th Ave., N.Y.C. White Daughters of Isis fez, for Past Illustrious Commandress Daughter Elouise McDowell. 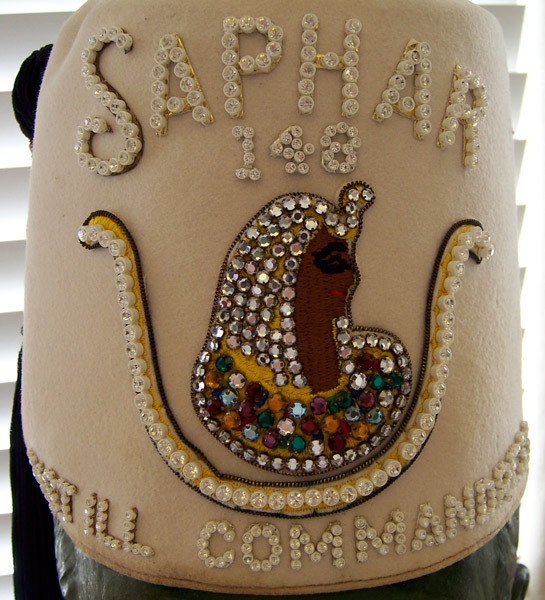 White/cream fez with “Saphar 148” and “Past Ill Commandress” in rhinestones set in white plastic cups. Isis figure in multicolored stones, set in metal cups, over an embroidered figure. Purchased in original white fez case, with Dt. McDowell’s name affixed. PHA Daughters of Isis courts top out at 107 (2016 DOIPHA website), so I believe this is clandestine. Red clandestine Shrine fez. Maroon velour, black tassel. A newer fez with gold bullion embroidery around gemstone lettering and decorations set in white plastic cups. Rhinestones are highly colorful, in white, green and red. Stones of the crescent and scimitar are set over silver foil. Fake pearls outline the emblem and emblazon the star. Tassel has no clip or other decoration. Temple name “Sahara” in rather large and ornate lettering, with a number “20” over the emblem. I have it on good authority that this is a clandestine org piece, not coming from the Prince Hall Affiliated AEAONMS. Many thanks to Brother Tony James for the clear identification on this fez. It is my opinion that i share with you concerning the issue of the Status for IF&AMM. Indeed it is a clandestine order from others. This is so due to the fact that IF&AMM is not subject to the jurisprudence, or jurisdiction of the United Grand Lodge of England, or any of it’s subordinate Grand Lodges situated here in the United States of America. However, that does not mean that Internation Free & Accepted Modern Masons are not real Masons. It simply means that it is a differant order and organization which is independant of the European Jurisdictional Status Quo. If you were to examine the integrity of IF&AMM’s membership, you will find that it truly stands upon the sqaure of faith, hope and charity and all for the brotherhood of man under the fatherhood of GOD. There is nothing wrong with indepenence, hence the soil beneth our own feet call the United States of America. Prince Hall Masonry was started by a Honorable brother with a sincere intention of uplifting his fellow countrymen of african decent. He had hopes that White america and the rest of the world of his time would recognize the virtue, courage and zeal that the Blackman had in his genetics and “accept” his people as human beings worthy to walk side by side with other enthic groups as thier brothers. Here is where the quote, “my brother from another mother” has its true worth! International Free and Accepted Modern Masons has created and established it’s own independence without worry of acceptance from prejudice human beings. It is not an order that rejects ethnic groups that are not Black, or of African genetics. People of all shades and cultural back grounds are welcome so long as they are worthy, duly and truly prepared, well qualified and are found to be in possession of all the necessary requirements to enter into the fold of this Intergral Fraternal Order called Fremasonry! Try any of IF&AMM’s Members, see if you can find that they don’t know the meaning of brotherly love, or their degrees. See if you will find them wanting and unworthy of being called a brother after having tried; If all you have to say is that they don’t trace back to the UGLE as “regular” and “Legally Constituted”… Then i guess the First wars of our country were fought so we could be seen as regular under english rule. I don’t see any red coats driving around in our neighborhoods kicking in our doors with writs of assistance, telling us America Citizens that because we are not from England we are not worthy to be called real free-men! But you tell me and my fraternal brothers that we are not real free-masons? Our Country, government, and citizenship was established by our declaration of independance and the establishment of our own Constitution! You telling me that Free-Men can’t Declare their independence in all Spheres of establishment? We the Free-men of International Free and Accepted Modern Masonry are willing to use our working tools the spread the cement of brotherly love across the world….Learn, Subdue our passions and Improve ourselves……how about you? If our independence is the only thing that makes us not real in your eyes, then maybe we have no need of the teachings that come from england…..sounds like they teach prejudice, racism, supremecy, and arrogance. The premise and teachings of freemasonry has no part in any of those things. We are builders of nations and bridges to make the conducive connections that will enhance human understanding in the service of GOD through the brotherhood of man. Bro:. Randolph C:. McLeod:., M:.M:. Thanks for your very thorough and thoughtful discussion. I hope that you have not found offense with the discussion that I had offered on the matter of regularity, as none was intended. As I note in my writing, I intend no value judgement, but rather only a reflection on traditions and rules. I don’t suggest that members of other obediences are necessarily not Masons, nor does their membership reflect poorly upon them in any way. I have a very friendly acquaintance in the Order of Delphi, for instance. He and I could not legally visit each others’ lodges, but we still value and respect each other as men and as Freemasons. i must say that i did find the topic disturbing… but i did not take personal offense as if it was an attacked from you. I can appreciate your subject matter and what it covered, that is why i responded with what i did to give our point of view. And I very much appreciate the time and effort on your part. You are very welcome to bring light (and even correction, when I am in broad error!) to the topics. Thank you! As of May 20th 2014, The Grand Orient de France has issued a Treaty of Amity with International Free and Accepted Modern Masons, Inc. And Order of the Eastern Star. Under the Supreme Grand Council of the World Order of Melchizedek or O.M.D.M. (Ordre Mondial De Melchizedek) Masterly Decree N* 20140520040 Patente Provisoire (Patent Provisional) signed by the Grand Heirophant International Guy Foucher, 99* and the Signed by myself here in America as i am the Grand Heirophant National 33*/97* for the American Grand Lodge of Esoteric Rites under the OMDM, there under the Authority of the Grand Orient de France. Most American Grand Lodges under the UGLE don’t recognize the Grand Orient De France either, nevertheless, they can not deny that they are equally as ancient as the UGLE. We deal in Pure MasonicThought and not Masonic Ignorance. Building Bridges and Nations is the goal of our Masonry…..How about yours? Well said my Brother they are know different then us (IFAMMILY). We need to stop the VIOLENCE & get it together. If you can’t say something great bout our organization plse say nothing at all. So well spoken my brother. You truly used your working tools. Very well done sir.S.M.I.B. You do realize that this is a blog about collecting used hats, right? I’m glad you’re enjoying my website. What perhaps needs to be remembered, is that we do not belong to the same organization, and that’s okay. No, a member of International Masons would not be able to sit in my Lodge; and I would wager that I would not be able to sit in a Lodge of International Masons, either. We shouldn’t act as if that fact is a crime against humanity. Rather, we should accept the reality of it. Neither can I enter a Lodge of Oddfellows, because I don’t belong to that organization. However, I don’t shake my fist at the IOOF Lodge across the street, because that would be silly. If my use of the word “clandestine” is offensive: well, I’ve already repeatedly (uselessly?) addressed my intentions in the use of it, and I need not repeat myself yet again. But that is the word that is used; I have no power over its definition, etymology, or proper application. What to me is Clandestine is to another man Regular, and so too the reverse. I’m very comfortably able to move past it.